Water project in Malawi. Picture: Earthchangers. Last year, in a New York Magazine essay called The Uninhabitable Earth, writer David Wallace-Wells painted a terrifying picture of climate meltdown, encompassing widespread famine, swelling seas and drowning cities. One sentence - “no matter how well-informed you are, you are surely not alarmed enough” - pretty much sums it up. Some of Wallace-Wells writes may be true - and for many of the poorest parts of the world, his words are already reality - but it is not necessarily useful. If we were to take everything Wallace-Wells wrote as gospel, we would come to a standstill of despair, divorced from an everyday reality that would appear increasingly meaningless in the face of the oncoming apocalypse. The option - and the only way to survive - is optimism: the belief that, while problems exist, they are not insurmountable and that human ingenuity and imagination will find ways through to a habitable world. A new global survey commissioned by Solitaire Townsend, co-founder of Futerra, shows that amongst adults aged 16 to 64 in 26 countries, 56% per cent were optimists, with a significant percentage describing themselves as ‘soft optimists’ (we can and we might). Debate between climate optimism and fatalism continues apace. Critics of the first argue that optimism leads to complacency, a loss of energy; critics of the second, that fatalism leads to paralysis and despair. In an ongoing project, HowNow Magazine asks interviewees, each of them involved in some way in the movement toward a more sustainable future, a single question: what gives you hope? The answers are delicious, exciting - and real, directly from those on the frontline. If it all gets too much, take inspiration here. “Sustainable tourism [gives me hope]. It’s how I live my life. It’s my passion. Tourism can have a positive impact, particularly as an industry sector, because it reaches every corner of the world like no other sector can. And that’s going to grow. If it has that influence, that can be used for good. More and more people are aware of that and even some big companies are doing incredible work. There’s a lot going on at grassroots and policy level, and at company level. At the moment, the missing link is consumer understanding and demand. As soon as that’s there, this market will take off. That’s just awareness and understanding." Participants from Deaf Plus, a charity that supports people with hearing issues, get stuck in at a Made In Hackney cookery class. Photography: Danielle Morainna. “Definitely the up-and-coming young people. There’s a great [reservoir] of power out there and great things to come from many of them. [There’s also] the growing interest in issues that, 20 years ago, would have had no attention - such as ocean plastic, the persecution of raptors on the upland moors. There seems to be, facilitated by a lot of young people, a growing level of public awareness. In my eyes, only good things can come of that." 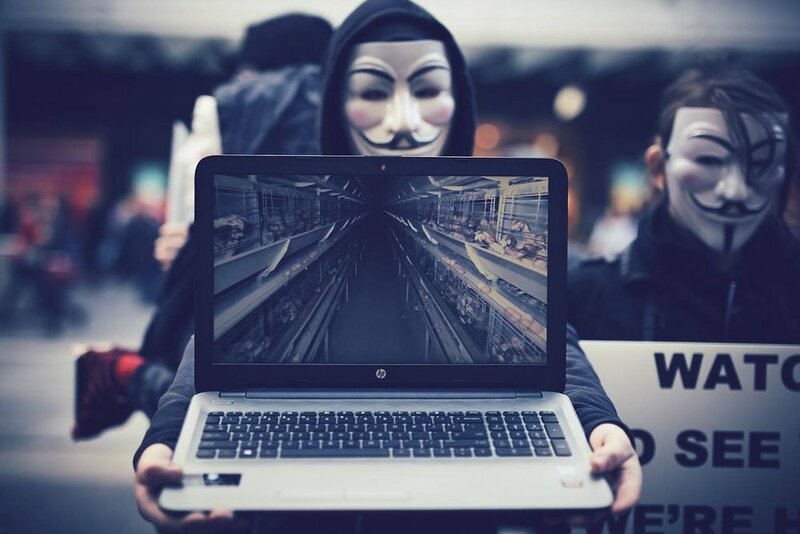 Campaign group Anonymous for the Voiceless works powerfully for the rights of animals trapped in factory farming. “What gives me hope? The youth getting involved in animal rights. The average age is mid to early 20s. The other thing that gives me hope is the natural compassion that all humans have. If you were to do a survey right now, 99 per cent of people would say they’re against animal cruelty and unnecessary animal suffering but the majority of them are probably still paying for it to happen. Not everyone is an animal lover but naturally people are against all suffering, whether that be human or animals. People say we are born vegan and I do believe that; it’s just about reconnecting people with animals and innate values that have been ripped away by advertising and tradition and conditioning. It’s a big fight because we’re up against - years of conditioning and trillions of dollars of marketing - but we do have the truth and justice and peace on our side. If you look at history and other social justice movements, like suffragettes, it always took a small group of people to convince the masses that something was morally unjust." "The idea that mentalities are changing and that individual actions aren’t a drop in the bucket. I see people really taking accountability for their day-to-day choices. The only way to create systemic change is by having that attitude: that all of our choices matter and that we have the power to make choices for the worlds we want to live in. We have the power to vote with our wallets and support companies that share those values. We live in a capitalist society and businesses run a lot of things and have a lot of power; as consumers, if we start putting these values at the forefront of how we’re making decisions, businesses have to respond to that to survive and adapt and maintain the market share that they hold so dear. The idea that someone else will fix [everything] is gone. Now is the time to become an empowered person." www.mamoq. com. Twitter: @think_mamoq. Instagram: @think_mamoq. Facebook: @think.mamoq.